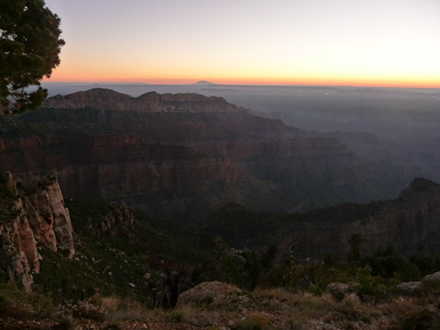 AFter a good night's sleep at the North Rim of the Grand Canyon, we got up very early to catch the sunrise at Point Imperial. 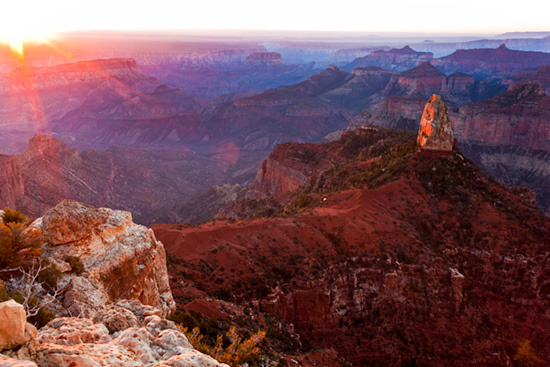 It was really early because Arizona doesn't go on daylight saving's time. So we had to get up at about 5 AM. 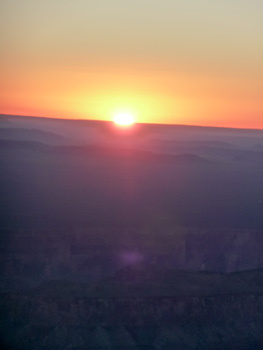 We got there quite a bit before sunrise and enjoyed the pre-dawn view. There were a few other early birds and everyone took turns sharing the better view points. It was really great that everyone was so cooperative. The sunrise was worth getting up for. 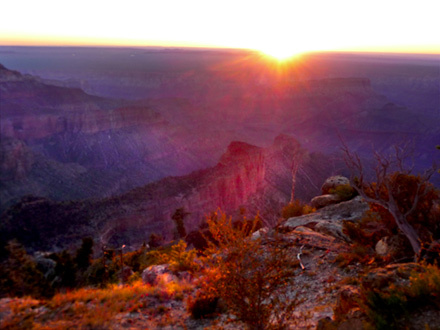 The effect of the changing light on the canyon has to be seen to believe. 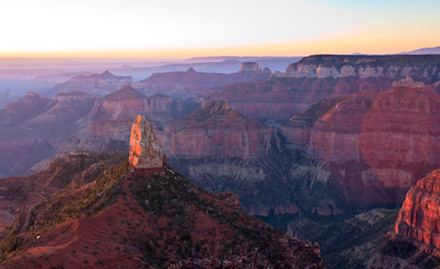 The rocks throughout the southwest respond to changing light much more than anything I've seen in North Carolina. We stayed around for a bit after the sunrise enjoying the view. There was some fog in the canyon probably as a result of the controlled burn that caused the smoke on our first day at the North Rim. We're not morning people, but the sunrise at Point Imperial was worth getting up for. Might make morning people out of us yet. 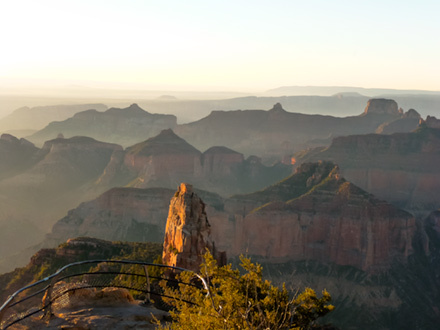 After the sunrise show was over, we headed back to our cabin at the Grand Canyon Lodge to pack up for our drive from the North Rim of the Grand Canyon to the South Rim of the Grand Canyon. It's almost a case of you can't get there from here. 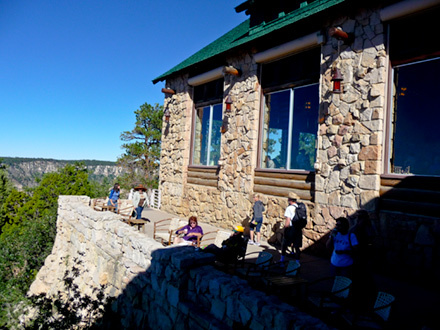 Before we left the North Rim, we toured the main lodge and hiked back out to Bright Angel Point for one last look. 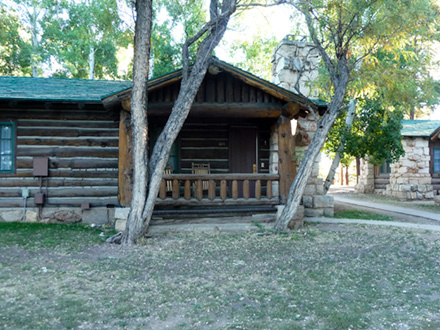 The lodge is impressive was are most of the older lodges in the National Parks. 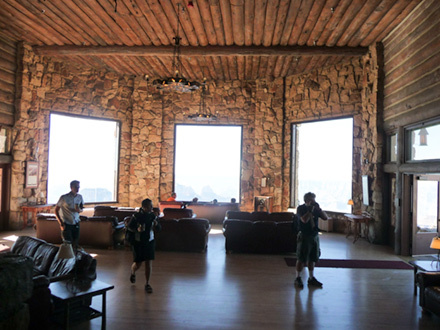 A highlight of the interior is the corner devoted to Brighty the Grand Canyon Mule. 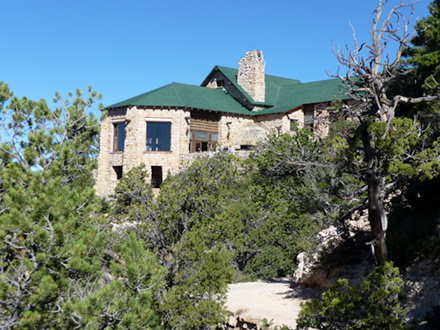 Brighty hauled water from a stream about one half a mile below the rim for guests at the Wylie Way Lodge, the first tourist lodge on the North Rim. Brighty was the star of a children's book and film, Brighty of the Grand Canyon . The book was written by Marguerite Henry. 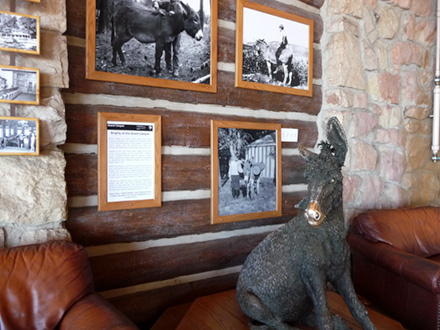 The corner of the lodge devoted to Brighty has a statue of the mule and photos of Brighty.